I finally got some time to write couple of words about our little trip to even further north than what my friend Kieran considers too far north. This free time is mainly due to break in the weather. It’s raining cat and dogs… Irish style. I’m currently in a tent under a waterfall in amazing place called Skaftafell … well look for yourself. Anyway, the 4 of us, Monika, Patka, Marzena and I arrived yesterday. I arranged the car rental through Ace Guesthouse, place we’ll be staying at on our last night (it’s a family run business, B&B and car rental located close to the airport. super handy if u leave very early – just like us 6.15am on the 31st of August). All the normal paperwork went fine and we ended up with a very roomy 4×4 Honda CRV. it’s important to get a 4 wheel drive if u think you’ll be getting off the beaten track. 2wd are often not allowed on gravel roads and insurance won’t cover any damages. Anyway extra cost is usefully if 4 people are going anyway camping for a week… extra room is needed. 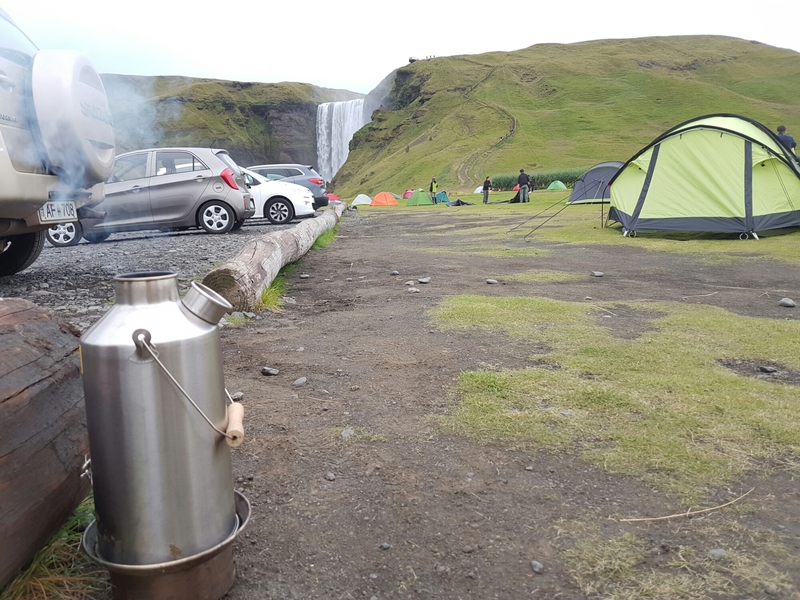 We spent the first night at the campsite in Reykjavik . and oh my oh my. it’s the biggest campaign palce I’ve ever been to. you could only compare it to a permanent festival site. hundreds of tents everywhere. some seems to be permanently fixed. We quickly pitched and went about exploring the town. it’s a good 30 mins walk. I recommend hiring bikes. it would make for better experience in a good weather. The city itself… well it’s a city. Building, statues, harbour.. and tourists everywhere. I’ll upload some pics when I’ll be on my laptop. on return we cooked some quick food and went to tents. 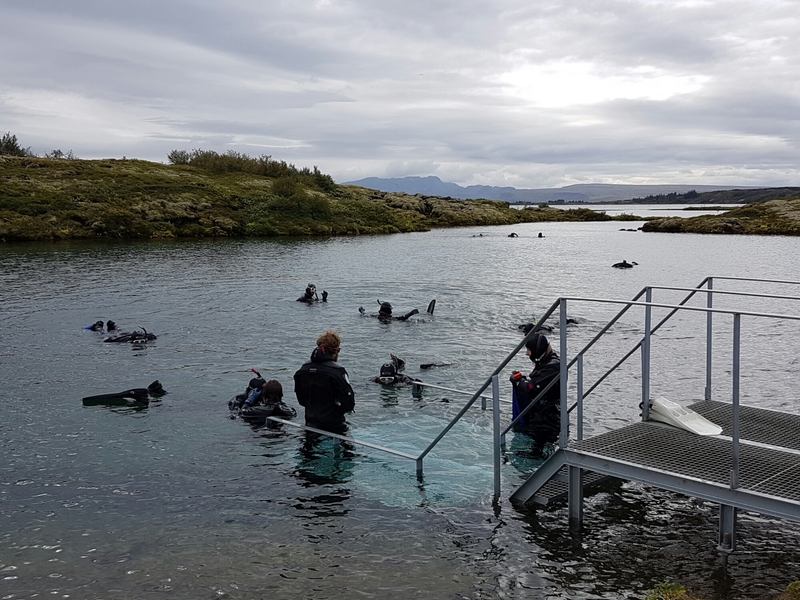 The next day (today) we had snorkeling booked at silfra. one of this must do things while u are here. initially I was contemplating between scuba and snorkeling and I’m glad we picked latter. visibility was amazing (you could see for 30+m) and the hassle of staying neutrally buoyant (I never done drysuit) in 2C fresh water (as well as cost of some 300euro for 40min dive) made snorkeling experience actually pleasant. The whole thing took just under 2h and I I think it’s a good thing to do but only if you are into underwater stuff. From there we moved a bit more east towards Geysir (a group of geysers) and Gullfos (pretty cool 30m waterfall). both atractions are close to each other and can make a nice day trip even if you are based in the capital. be aware thought tons of tourists everywhere. We are moving counter clock wise through the ring road so to make it back on track we had to travel south now. it took around 2h to get to the place I’m writing from now (mentioned at the beginning of the post). By the way the mobile coverage is amazing I this country. we r in the middle of nowhere and I get good signal with nice data connection (I bought local.simcard with 1gb allowance. highly recommended- it’s only around 15euro). Tomorrow we’ll explore this area and move more east. I’ll update probably every 2 days.